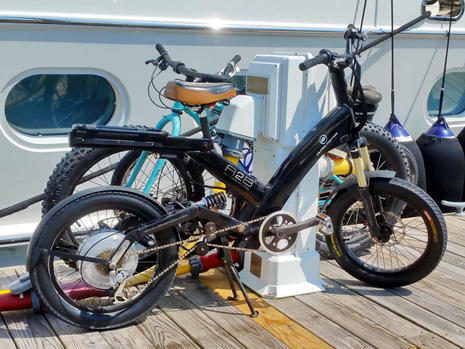 My first ebike experience was a brief test of the Gocycle G2 at the 2014 Fort Lauderdale Boat Show and that Panbo entry attests to how dangerously tempting I found it. While the super light and stowable Gocycle seemed to offer the pleasant feel and mobility of a regular bicycle, it was easier to use even when not tempted to add a smooth electric boost. And, mind you, that old grinning guy above was hobbling around the show on a soon-to-be-replaced arthritic hip (oversharing here). But Gocycle, like Tesla and Torqeedo, is a company that’s prioritizing innovative epower engineering and beautiful design over price. 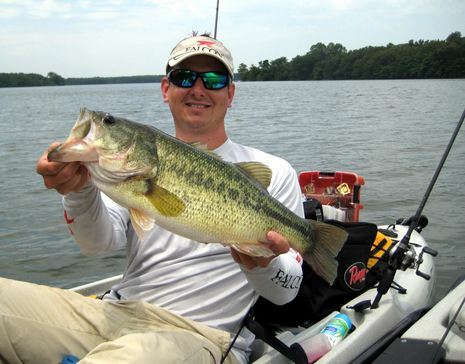 The latest G3 model costs $4,499, and that’s before you add some of the accessories desirable for boat use. There are many other folding ebikes out there, but the huge design variety confused me and they all still seemed expensive, especially if I wasn’t positive that I’d use one a lot. So my wallet stayed put, at least until Brian Strong (of tricked-out P47 fame) told me about the Sondors phenomenon last July. The Sondors Kickstarter project had gotten nearly 2,000 backers, and by the time I heard about their very nicely priced fat tire ebike — $694 with shipping — there were many thousands in use and mostly favorable reviews (like here, here, and here). Brian, an experienced road biker, was already pleased with his newer Sondors Thin model and I went for an Original 4.0 “special” that are still available for quick shipment (in limited color choices ;-). 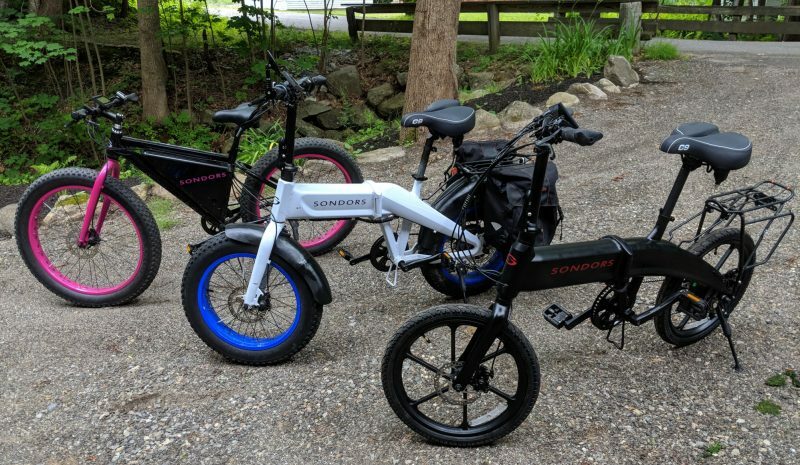 I knew Sondors offered no warranty and hardly any service, but you’re seeing many decent bike and ebike components in these just-assembled photos, and the Sondors owners Facebook page is arguably more valuable than many customer service operations. The photo inset above shows the simple lever throttle and battery level indicator that came with my Sonders, but like many ebikes it also has a pedal assist system (PAS). What it does not have is a derailleur. This 60-pound monster of a bike is single speed, which would normally make it ridiculous for a hilly area like mine. But I’ve learned that ebikes don’t abide by normal rules; further inefficiencies like a heavy steel frame and big soft tires don’t matter as much when a motor quietly fills the gap between the energy needed and what you’re willing or able to expend. For example, on Maine’s occasional hot muggy summer days, I could usually ride the mostly uphill mile plus from Camden Harbor to Panbo HQ quite quickly without breaking a sweat. (Make that about 150 feet up over 1.3 miles according to the nifty HeyWhatsThat online path profiler seen above.) In fact, I was often zipping through downtown tourist traffic quicker than by car, felt quite safe about it, and got some exercise in the process. Plus, it’s a blast, and that’s largely why I’m still riding on “warmer” winter days. 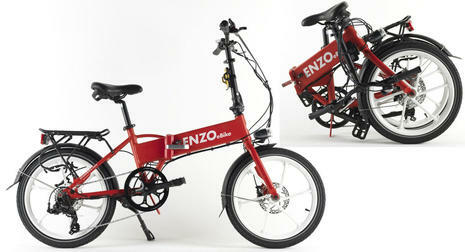 The question now is how my Sondors experience translate to an ebike that can fit and survive on a Duffy 37 named Gizmo? At least for Camden and similarly curvaceous ports of call, I’d like a little more epower than what’s provided by the Sondors’ stock setup and also a few pedal gears. As is, I can’t quite pedal at the speeds I’m sometimes comfortable with on flats and going down hills, and I struggle getting up some grades even at full throttle. 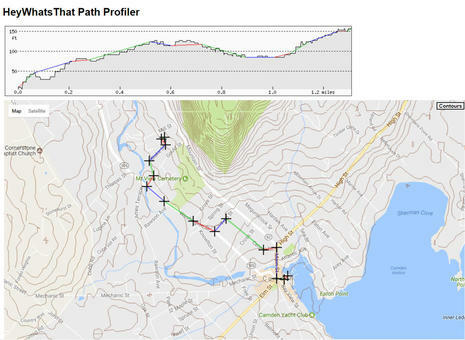 To be specific, I have to stand-up pedal if the grade gets to about 16% (or 9° slope, as measured with a phone app), and I’ve worked out local routes to avoid them, as suggested on the path profile above. 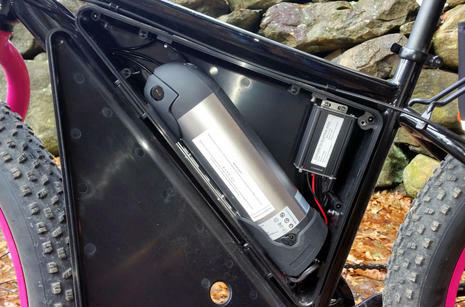 Now there are many factors involved in how powerful an ebike will feel for a particular person in a particular situation, not least of which is my personal 200 pound bulk plus the “stuff” I tend to lug to the boat or from the store. I also keep the 4-inch knobby tires at low pressure to cushion the ride and better deal with potential issues like loose gravel on road shoulders, though they’re definitely more efficient when pumped up. I’m asking a lot from an already-heavy single-speed ebike with a fairly minimal 350-watt rear hub motor, though I have already improved its effective power and gotten 5 pedal assist levels with LunaCycle’s $100 combination of “Hot Rod” controller and LCD DashBoard (which seem very similar to what Sondors now supplies on its regular to-order bikes). Ebike hot rodding? 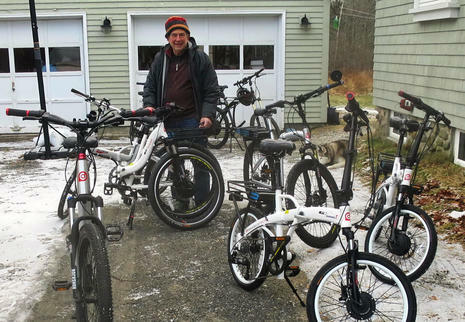 While electric bikes may still be a small but growing niche here in the U.S. — it’s bigger in Europe and huge in China — there’s a vibrant world of do-it-yourself designer/builders and more than a few of them become manufacturers. For eye-opening examples, check out this 10 Fastest Production Ebikes 2017 list. Note, too, that Sondors’ success is partially due to the spacious electronics compartment seen above, which makes it easy to try different batteries and controllers, and then that success led specialty shops like LunaCycle to offer all sorts of specific Sondors upgrades (Velomobile too). 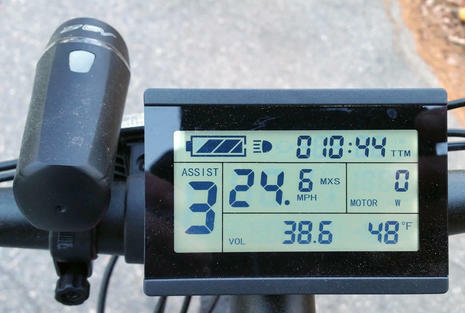 As I shop for a boat ebike I won’t settle for much less than what the LunaCycle LCD dash provides (good demo video here). Using the three button keypad, I can select the pedal assist level that suits my mood and also one of three data screen layouts. While it’s fun to have speed, time, trip, odometer, and even outside temperature readings, I think that at-rest-voltage is critical to acquiring a precise sense of battery range, and seeing the realtime wattage burn is also useful to understanding an ebike’s capabilities. Incidentally, I have not yet tested the real range of this Sondors with me aboard. Actually, I hope to avoid that completely as getting home in these hills with one gear and a rear hub motor that drags a bit — front hub motors like Gocycle’s freewheel — would not be fun. 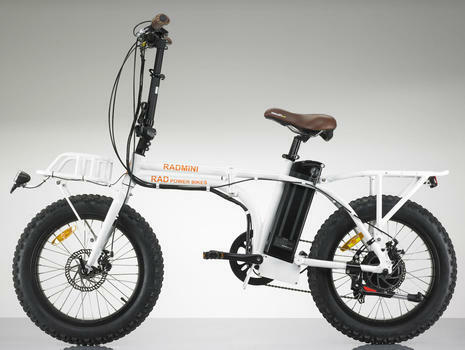 And with that I’ll add that some riders get ebikes that fold up mainly so they can Uber home if they run out of juice. Unfortunately, and perhaps an occupational hazard, I can picture how much further ebike dashboards could go. An integrated color screen with GPS plotting on road and/or topo mapping would obviously be nice, but how about an indication of range based on battery level and current wattage use? 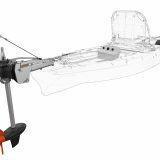 It’s a bigger challenge on land, but that’s what made Torqeedo electric outboards like my long test 1003 more relaxing to use (and it also has a Bluetooth app interface in addition to what’s available on the tiller). And while some serious exercise bikers frown on ebikes — I sometimes apologize when I pass one on a hill — it seems like they could also neatly measure the human energy involved. For instance, most pedal assist systems are based on magnet-measured cadence, which is the same value collected by the Garmin bike sensor that I could have talking to the Quatix 3 watch I’m already using along with Garmin Connect to track my rides. Moreover, smoother performing pedal assist systems, again like the Gocycle G3’s, use a torque sensor which would be an even better measure of calories burnt, I’m pretty sure. These are just some of the ways that ebikes will likely improve, though I’m glad I didn’t keep waiting. Here’s a shot of the pink beast fully accessorized to my “needs” and posed above Gizmo’s fall berth. I’ll note that I was not at all tempted to go down that low tide ramp, though fat ebike craziness is a possibility. At 70 years old, crashes are a bad idea, which is largely why I like the big tires and also how the epower helps me get going from a stop sign or keep up in slow traffic. Safety is also why I added the Blackburn Multi Mirror and LED lights I can set to strobe (which I’d like to upgrade, maybe even to Lumos). 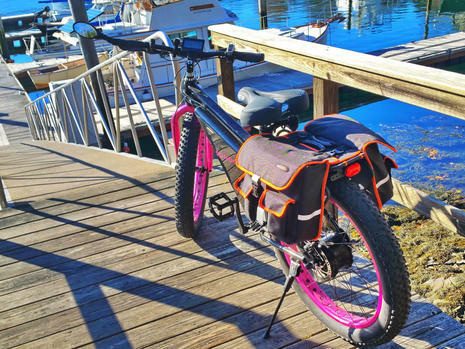 Meanwhile the Ibera PakRak and 2-in-1 Panniers speak to the utility this bike has, while that Barcalounger of a Cloud 9 Cruiser Saddle is all about comfort. All in all, I’m still under what is affectionally called a “boat buck” and riding this Sondors reminds me of what biking meant when I was about 12 years old as well as a dash of tooling around in a squishy old convertible like a ’59 Caddy. So I’m nearly ready to invest more funds in an ebike that could stow in Gizmo’s aft cockpit, but there are many potential choices and none will be quite like the Sondors I’ll probably pass along. On the other hand, that collection above could be one boat/ebike nut’s fleet and I understand that mentality. I really don’t know as I took the photo from a launch at the Northeast Harbor Marina — an excellent place to bike for food and fun — but that older A2B Metro certainly has some pizazz. I particularly notice the full suspension, and I understand that bikes with 20-inch tires are inherently rougher rides simply because less tire is on the road. However, this bike does not fold and weighs 72 pounds — it was a large yacht — while I prefer the moorings at Northeast and envision an ebike I can sometimes get ashore in Gadget. An ebike show would be useful in my situation, but so far I just feel super lucky to live a short walk from no less than Atomic Tommies. That’s the enthusiastic and knowledgable Tom Resek himself and he’d kindly rolled out some stock to show me on a recent frosty day. He mostly sells (and rides) ebikes from the wide Prodecotech line, and here he was showing me the Stride 300, unusual because it’s a folder that retains the full 26-inch tire feel. That might fit OK and I’m also attracted to the step-through — as opposed to swing creaky leg-over — frame design. I also took a short spin on a Mariner 8, a true boat ebike with numerous noteworthy features at a price I’ve come to think of as fair outside the nearly inexplicable Sondors bubble. I appreciate how Prodecotech is more specific than most about what “rust-resistant” means — though I may bring along a magnet when we get around to warmer weather demos — and also the “industry-best, two year, front-to-back components warranty,” especially with Tom in the picture. I found the mariner easy to figure out and it rode fine, all despite the unfamiliar forward motor position and lack of pedal assist, but the feel is a far cry from the Sondors. In a word, it may not be “beastly” enough for my taste. But there is the shopping wisdom of trying to suppress “taste” urges and maintain an open mind. The Enzo ebike is rated one of best folders at ElectricBikeReview, which seems the most industrious of several review sites. It too is “marine ready” — note the magnesium wheels — and I find the wide folding frame member that also holds the battery and controller clever. Plus, hey, there’s a wide choice of glow-in-the-dark paint jobs, pink included. While it’s no surprise that EBR’s other winning folder is the elegant though pricy Gocycle G2, know that “The Affordable Gocycle” Kickstarter project went very well, which suggests that a retail GS model is not far over the horizon. The more I learn about Richard Thorpe and his crew, the more impressed I am. But currently I’m drawn to these bad boys, the VoltBike Mariner above and the Rad Power RadMini below, and by now I think you know why. Hopefully, you’re also better able to decipher the major specs and minor details, and a convenient place to start is this impressive EBR comparison page. The Volt is looking like a better value at this point, and small details like front and rear lights both run with the dash off the main battery impress. But then again the Mini’s rear rack extends for long loads and that beastly 750w/48v/11.6ah power system should mean longer range and the choice of assist or pure scoot modes regardless of grade. But I’m not in hurry, the next cruise south is many months away, and perhaps this entry will generate more leads. 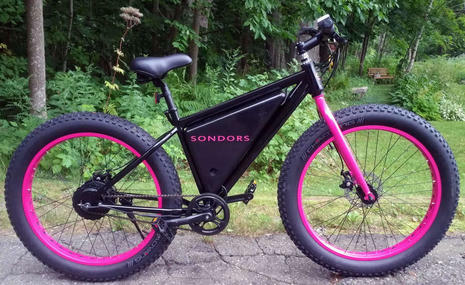 Finally, I tried to detail the Sondors performance in depth because I think it’s still an valid choice for a terrestrial ebike, especially if your area is flatter or if you’re somewhat smaller and/or stronger. By way of scale, my athletic friend and relative Jared is 5 feet tall and could just barely stand on tiptoe when stopped. 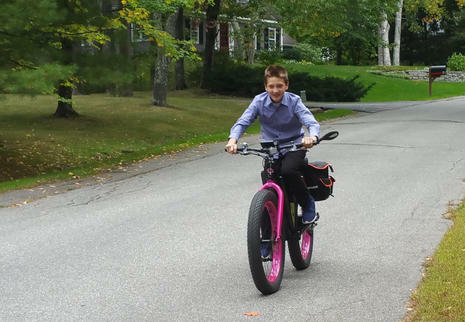 And, yes, I certainly should have fitted him with my helmet before his first ebike ride, but it was just a Thanksgiving holiday moment and a quiet, though steep, dead end street. At any rate, he took command of the bike almost immediately even though his 95 pounds meant significantly more power where the rubber meets the road. And that grin, my friends, is a straight up fat ebike joy. eBikes with only pedal-assist, are basically allowed anywhere a normal bike is. Once you add a throttle, you are not. For example, in NYC, throttle eBikes are banned. Also on many bike trails in various locations I have been. Even if you are not using the throttle, if it is equipped, they may not be legal. Just something to be aware of while shopping around. My wife being from Belgium, I have been using and following eBikes for a long time. The biggest (and best IMHO), components are the Bosch Mid-Drive system. We are starting to see them here in the U.S. on the higher end bikes ($2k+), but suspect things will settle down given some time. In Europe, you can get the Bosch system for a little over $1k. I am not sure of any folding Bosch bikes, but they might be out there. There are some general advantages to a mid-drive vs rear-drive system as well, even without the Bosch system. Glad you are enjoying your eBike. They are fantastic. The old motto, don’t knock it till you try it, definitely applies. Thanks so much, Mark. All valuable info. I recently purchased to of the Rad Bikes rad minis to carry on the deck of my Nordhavn 40 which has limited space with a dinghy on board. So far I am very impressed. For bikes that are made in China, the fit and finish is very good and they are really fun to ride. I recently took one of them on an overland trip by Jeep into Baja California and the fat tires allowed me to ride over rocks, on dirt roads, and even on loose sandy beaches with no problems. I was very tempted by the Gocycle G3 after test riding one a few times, but like mentioned in the article, its easily over $10k for a pair of them equipped well enough to transport groceries or supplies to a marina. The rad mini has front and rear racks and I even mounted a seat pad on the rear rack that my 6 year old daughter can ride on. The weight at approximately 60 lbs in the one downside. 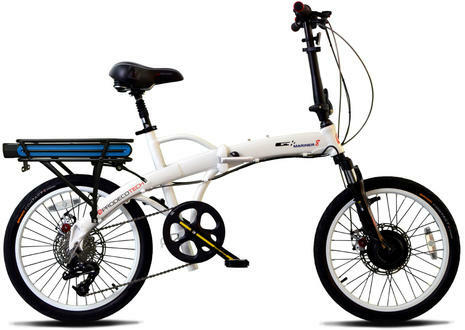 Also, compared to something like the Gocycle G3 with its enclosed drivetrain, or belt driven electric bikes, the rad mini uses a traditional cassette and rear derailleur which is prone to damage and corrosion on a boat in salt water. Im having a couple of heavy duty bags made to help with lifting them on the deck and to protect from UV and salt water spray. Overall, very happy so far. Wow, Terrapin, what a fleet. I love picturing a Nordhavn 40 at an exotic dock with two RadMinis alongside. Practical, fun, and mega beastly! You might be interested in my thoughts about a protective carry bag. I envision cutting a piece of plywood to the approximate footprint of the mini or similar when folded. I’d take that to a canvas shop and ask for a sort of bag that would screw fasten to the bottom of the ply with an almost edge to zipper and a couple of hearty straps. Might put a little cushioning inside the bottom and some non skid feet under it. Hopefully the result would look pretty good, protect the bike well in my cockpit, and make it easier to hump it into the tender. I have been riding ebikkes for about 7years. The sonders is a very nice beginners bike and definatly better with upgrades from lunacycle. I have purchased and built a few bikes over the years. Hubmotors are fun and easy to install but heavy. Middrives are light and more well rounded but take a little knowledge to install on your own. There are many options out there but from someone who has been following the scene….definatly check out lunacycle. Their bbshd based folder is amazing. I am saving up for the folder they sell or maybe their scooter. Not sure which yet. For now the cyclone I got from them is the most fun I’ve had on any of my builds. Why would Jared need a helmet if he can bike?? Yes, car racers wear helmets, but commuters don’t. The difference might be in the fact that US roads are made for cars, Dutch roads are far more designed for cyclists. My oldest daughter spent a year in KY and it was normal in US eyes for her to get a drivers license at 16 and drive to school. Cycling to school was another matter: quite the norm in Holland but very special in the US, had to fill in waver forms and double check insurance, she even made it to the local newspaper 😉 One thing about e-bikes, they are used a lot by elderly people to ease the burden while cycling. But often a lack of vehicle mastery leeds to dangerous situations and accidents. And no, they do not wear a helmet. Topography can be another burden (and joy), Leo. I just checked and my little town has more range (0 to 1,385 feet) than all of Holland (-23 to 1,059 feet ;-). Moreover, we have no bike lanes anywhere and many roads do not have even gravel shoulders. Kentucky is probably similar but some U.S. areas are becoming more bike friendly. Helmet use is a touchy subject and applicable to many/all things. Helmet function is to prevent skull penetration and to decelerate the deceleration process. Deceleration is the key role in most, as I’m told 35mph-to-zero yields death. Stretch in lines and helmet padding act to reduce the rate of deceleration so that when we hit “zero” we are moving as slow as possible. Somewhere between 35mph and zero we turn into vegetables. I once had this conversation with some world class ski racers (as in macho athletes). We were surprised as to how many of our acquaintances-turned-vegetables were the result of bicycling accidents, some of which due to undramatic smack of the head on concrete. And as a result, how many of us wore helmets when biking. The saying is that it’s not the fall that kills you, it’s the sudden stop. Thanks, Andrzej. I might not have put it in those terms before but I definitely like the idea of decelerating the deceleration. Where I live, helmets have become a political/cultural issue, at least for certain very vocal motorcyclists. So far they have managed to keep Maine a state where you can ride a very powerful bike with no helmet. Their strongest opposition are emergency room surgeons and regulators who say the consequences unnecessarily cost all of us taxpayers. A political/cultural issue, but not a scientific/medical issue. I knew a guy who fell off his ten speed while standing still, hit his head, and died. Macho is the male equivalent to Bimbo. But it’s more than life or death. The in-between cases involve concussions and the evidence is growing that these are far more serious than previously thought. I’m looking for a cheap little thing to wear around the boat just to avoid the pain of hitting my head on something. Thanks for visiting the subject of ebikes for boaters. There are scant (no?) 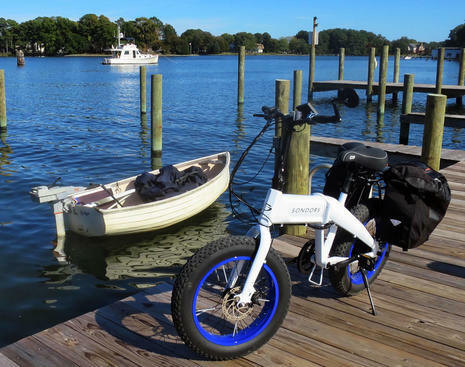 other reviewers of ebikes that present the bikes from a boater’s perspective. a. Cost. Yes, the Geocycle G3 is at the top of my list, but at ~5K a pop, out of my reach. b. Volume. My boat, a Pacific Trawler 40, is severely limited in interior storage space. Therefore, any ebike I carry aboard must be stowed topside, either on the boat deck or in the cockpit. Less is more here. c. Weight. Obviously, less is more here as well. I’m an old goat, so Weight influences how often I’m tempted to hump the thing off the boat and onto a dock, or into my tender while anchored out. For instance, 60 lbs. for the Sonder moves it firmly into the “nope, that won’t work for me” column. d. “Foldability”. If the bike requires multiple steps and/or tools to use, that turns me off. e. Energy storage. I’m not interested in touring on the thing, but it must contain enough stored energy and use pedal assist to conquer the typically hilly terrain surrounding towns along the seacoast in the PNW. For me, “distance to empty” is typically only a few miles, as my use will be to/from the grocery store, marine supply, restaurants, etc. If I have to get off and push, that doesn’t light my fire. OK, so what are some of the metrics at the BOTTOM of my list? a. Materials. While exotic materials will undoubtedly lead to lighter, stronger, smaller ebikes, I’m not hard-over on “marine-grade” materials for my ebike. I’m content to protect the bike during storage, maintain it accordingly, and probably off-load it and take it home to warm, dry storage in the wet, cold winter months. b. Electronic displays. As I mentioned above, all I value is a simple gas gauge. Ideally, this gauge can credit my “distance to empty” range by integrating my personal exertion on the pedals, and help from Mr. Gravity to accurately predict when the bike poops out. c. Tire size. As I’m not touring on the thing, I am not hard-over on either tire diameter or width. Vehicle dynamics says bigger is better for tires, but I’m willing to sacrifice ride quality for size, weight, cost, etc. d. Lights, panniers, racks, etc. are extras that I typically won’t use. Until proven otherwise, a simple backpack will suffice for now. And I doubt I’ll ever ride at night. Just guessing here, but I bet ebikes are every bit like a boat-they’ve ALL got compromises! And I’m an old, tired, fat guy with a small boat and a not particularly athletic wife, so my mileage will vary. But if I can find an extra $10K under a rock somewhere, the G3 is mighty tempting!!!!! Pete, I suspect we’re fellow pigs in a poke. I’ve yet to come across an ebike sales site with photos of old, tired, fat guys enjoying the products, but sometimes those smart young’n aren’t so smart. But one manufacturer that impresses with its realness and style is Lunacycle (check their blog page links), and either of the two folders I linked to a comment above might meet your needs nicely. As I understand it, for instance, those mid-drives should make for good hill climbing because the power passes through the multigear system. The product descriptions are not too detailed but hopefully they field questions well. Also, maybe you missed my bit in the entry about how Gocycle is now building an “affordable” GS model. The first batch go to Kickstarter backers but I suspect that it will eventually show up on their main site for regular purchase. Well said, Norse, and let me add that wearing something like the famous longbill Panbo cap around a boat does not help with the noggin bumpin. If I’m headed up the 3 steps from “below” to Gizmo’s main cabin in a slight hurry and/or distracted and/or especially when capped, I sometimes drive my head hard into the forward companionway frame. I’ve done it dozens of times now, I think. And now that I think about it, I really should install about two feet of that sharp 3/4 canvas-covered rubber bumper used on yacht tenders, leather ends and all. I guess we’re getting off topic, but this is a worthy sidetrack, I think. Following up on your comments above-yup, we’re fellow “pigs in a poke” allright! Seems like our interests are aligning quite nicely (uhhh, older fat guys, on boats, perhaps with all original parts, some still working, looking into mobility issues while afloat, etc.). GREAT hook to the Lunacycle web site. VERY interesting! Lunacycle has led to my awakening that I don’t give a rats patootie about “street legal” ebikes. If being non-street legal equates to more hill climb ability for El Rotundo (me), or perhaps relief from range anxiety, that suits me just fine. In the rural parts of PNW, NOBODY cares that one’s ebike fits California’s definition of a “Class-1 ebike” that is legal on bike paths. Nor do we care a throttle-equipped ebike can’t be used where other bikes can. When the typical conveyance in town is an ATC (like in Pelican, AK, for instance), I’m sure a Lunacycle Ludicrous (for instance) would be just as fine as frog’s hair. Wish I had a big boat the thing would fit in! Looks like the bomb. Unfortunately for me, I’m somewhat leery of dropping bucks on an ebike I can’t touch, feel, and ride ahead of time. And I’m pretty sure Lunacycle is located somewhere east of Interstate-5, so despite rave on-line reviews of Lunacycle products, I’m sort of stuck moving forward right now. This is, of course, a personal problem, and I’ve got lots more work to do before I plunk down ANY ebike onboard my boat. And as always, life’s a compromise, YMMV, blah blah blah. 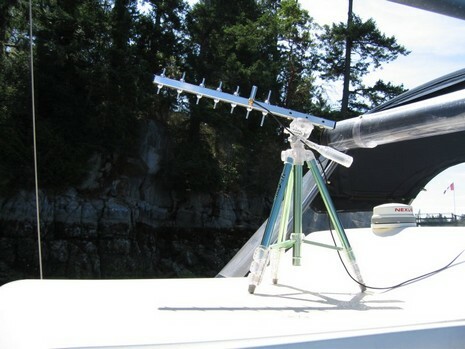 But thanks again for tackling this particular issue from a boater’s perspective. I look forward to tracking your progress. ps-also looking forward to an update on your house battery replacement. I’ve been thinking about those too. so, in mode eBike, it is like any other bike with a perhaps larger basket hanging on the steering. In mode eTrolley, I fold the wheels to 90 degrees to same side and the steering/basket is slided so it is centered in between wheels and a smaller wheel goes down to make the tri-wheel base. Then it will be simple to go from dock to mall, running around (perhaps even assisted? 🙂 ) shopping and then fold out to bike again for the way home. I see what’s he talking about and Bike Friday’s excellent online “Build this Bike” system is a great way to see what can go into a custom high-end ride. For instance, a 20 pound Pakit with its carbon belt drive and internal hub gearing could be a great small boat bike. Remember that the nicer the bike the more it is desired by those with little regard for stealing someone else’s property. If you use it for shopping it will be left unattended and there is no cable, chain or padlock that cannot be cut in 60 seconds with a battery powered Dremel and diamond cutoff blade. My first cruise 5years ago with a folding ebike started out wonderfully but ended in rust and battery damage…. plus, despite its diminuative size, it was a bear to store but I loved it (while it worked) so much I replaced it with an A2B Metro and I’ve been riding that bike for 4 years with zero issues but it’s way to big and heavy to bring aboard so…I’ve been cruising without a bike. I have zero interest in taking another ebike on a boat but I have been very jnterested lately in electric skateboards and scooters. One company, Boosted Boards, looks like the perfect solution to the problem of shoreside transportation! They are pricey but easy to store and designed to withstand the salted streets of winter in New York… so I think they’d do well on a yacht (Watch Casey Neistat’s review on Youtube)… there is only one problem and it’s a big one… i don’t know how to ride a skateboard. So what I’m looking for now is a weather sealed stand up electric scooter. There are plenty of escooters but my experience with cheap ebikes has left me sour to the idea of buying anything but the best quality ride. And I’d love to hear suggestions if anyone knows of such a product. I saw a woman riding an URB-E in the marina parking lot the other day and thought it has great boat potential because it is so light and folds so small. It is more a scooter than a bike, i.e., no suspension, but it looked very useful. Mike, I imagine you’re right about the state of robber technology, but that cuts both ways. GPS/cell trackers with geo fencing you can set with your phone are getting surprisingly small and there are a surprising number of places to hide one on most ebikes. The result, of course, can be an airtight grand larceny charge and you get your bike back before the creep could mess with it. For head protection aboard consider a construction type hard hat. Some are very good quality and after being worn a few times begin to feel comfortable. I don’t care for the one size-fits-all type but prefer the better quality made-to-fit hats. They can all be spray painted to a color you prefer and decals with your title and boat name can be added. Agree, Ben. A construction hardhat is not only to protect you from falling objects, but, more commonly, from head banging when working in confined spaces like engine rooms. In all the power plants I’ve worked in hardhats were required outside offices, etc. Thus my thoughts for aboard boat use. Hearing protection was also required but that’s another subject. The excellent long billed Panbo hat is probably just as good, or not. Sorry, Butch, I misread your first post. And, sidetrack be darned, I know where you’re coming from. My dad worked for Connecticut Light & Power from when I can remember til retirement, and we lived less than mile from the Falls Village hydro plant. That may be where I saw my first hard hat. It’s definitely where I saw my first turbine and my first Marilyn Monroe calendar. It was sort of a treat to ride shotgun as Dad did his round of substations, except that one task he had was accident reports. I did not like those pictures, but they might have been good for me in the long run. The more you dig into the world of ebikes the more is going on. There’s immense energy going into design and also business models that hope to put them in every garage and bike rack. 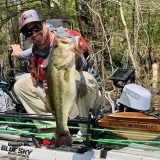 I hope and expect this technology will add to the kayak/dinghy motor options. Sorry to be OT, but for a boat helmet I was thinking something lighter and softer. Each sport has its own helmet, I just have to find the right one, preferably something that floats. I googled helmet liner and found interesting things, one called a protective skull cap, and another high-tech material called Gyro by Unequal. And note that more power and a 7 speed gear set are options. However, they will only be available to current Sondors owners this year and — classic Sondors style — they’ve already missed the deadline they set themselves to tell us owners more details and give us a chance to purchase. Which I might do. PS It occurred to me that the only contact I had with Sondors during the buying process (or since) was a robo email “notification of purchase.” So today I replied to that email, changing the subject line somewhat, to make sure I was on the list for Fold notification. And, sure, I also suggested that I might be good candidate for a review unit loan (with possible sale) and included a link to this entry. I got back another robo email which does say that “Someone from our dedicated customer service team will be responding to you as quickly as possible” but we shall see.  To my knowledge there is no Sondors phone # or email address available except for the one you get when you purchase one. I only write all this because anyone considering Sondors should be aware that this seems to be one aspect of the low prices. Hadn’t seen the Urb-e. I’ve been looking at eccorecco scooters and also the airwheel concept (which I’m guessing has a steeper learning curve, but goes off road etc.) Would love other’s feedback for electric scooters or wheeled solutions for metropolitan area commuting, as well as aboard the boat. Seems there is now a folding e-bike with a Bosch Mid Drive. Rather high-end at $3400, but is probably a very nice bike. 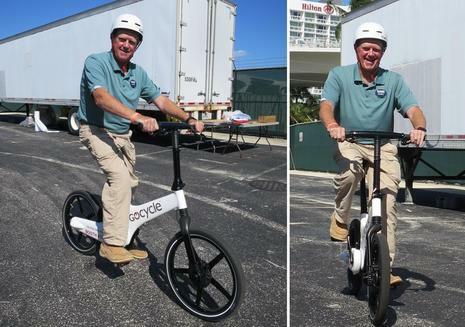 I spoke with GoCycle at the Miami Beach Yacht Show and they confirmed that the GS KickStarter project will eventually be offered for direct sale online at about $2,500, and that a long term company goal is to get their high ebike tech to the $1,500 sweet spot. Yike! Please forget the Stark Drive ebike plug. Today its Indiegogo campaign was shut down “under review by the Trust & Safety team” and all backers were refunded. Including me. I feel naive, a lot, but undamaged. Yes, it’s an Indiegogo project but they’ve already received their funding (over a million $) and Batch 1 scooters should be shipping pretty soon. One thing to look at are electric skateboards. Very powerful, very easy to store and carry (great for ride hitching). Not good for unpaved roads or carrying large quantities of supplies though. I have a Marbel, there are numerous other brands like Boosted. I ordered the white model with blue rims, which seems yachty (yet still beastly). Ever receive your Soders Fold-X? 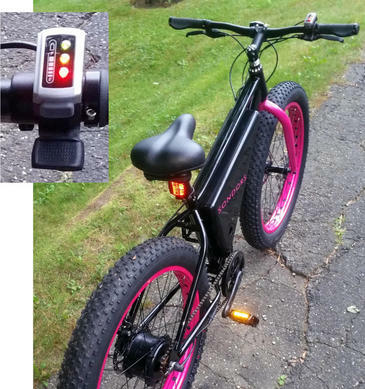 If so, how has it worked out as a boater’s E-bike? 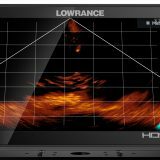 I’m intrigued with the design and build, but reluctant to order via the WWW without some feedback from fellow yachties on it’s real functionality. 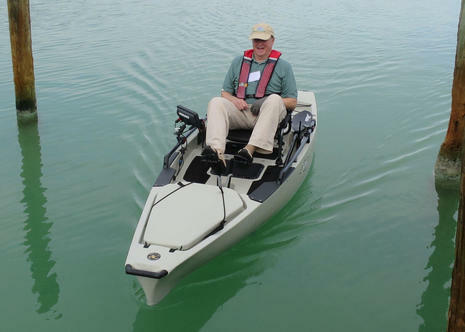 You will see that I found it a little heavy and cumbersome for getting on and off the boat, particularly via dinghy, and that was my excuse for the recent arrival of a smaller Sondors Fold Sport. I now have about 40 miles of Maine island riding on the Sport and have found it noticeably easier to dinghy ashore but still a strong, fun ride on pavement with its 2-inch tires. The Fold X7 with its bigger motor and battery is now my everyday ride around hilly Camden and sometimes on trails. Now that I’ve experienced three Sondors bikes over two years, I’m impressed with how well they’ve held up and also how the design and build quality keeps getting better.